BCD-101: Rafting + Atv ride +Spa. Today is a good day, Bali Sunshine, breezing… and we offer a very special adventure package for Bali Adventurer, let’s wake and don’t to much sleep during your stay in Bali. I will wait you at your hotel lobby at 08.00 am, so hurry up come down to lobby hotel. Our special Bali Adventure package today is Ayung river Rafting + Atv ride + 2 hours Spa, have you heard or experience on this package ? if not, you have to call us or WhatsApp at +62 878 6196 8073, then we will prepared driver with our Bali Transport service. Lets drive to Sayan village where we will join on the Ayung River Rafting with trip along the river for about 2 hours, grab your paddle, helmet and life jacket, listen our safety talk then get ready to wading the Ayung river with Waterfall stop, look at cliff carving and plunge into the river, floating…… feel so much fun and adventure. After ride you need changes then continue with 2 hours spa package treatment; Foot wash, Balinese body massage, body scrub and aromatic flower bath. Really memorable adventure if you joined with us as you will be pick up by our private Bali Cab Driver. 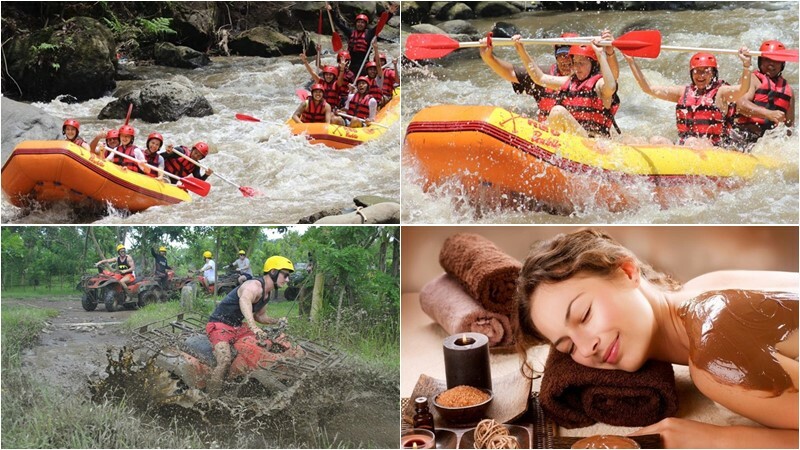 10.00 – Join on Ayung river rafting accompanied by experience intructor. 13.30 – Join on 2 hours Atv Ride. If you take package without spa, we may do Atv ride first + Rafting. Child will be with tandem ride with Parents. Atv/Quad bike ride with all safety tools and insurance. Professional rafter guide & Quad guide. Extra dry cloth 2 pcs. Socks and glove if any.